Issaquah is a city in King County, Washington, United States. Explore hidden gems such as Paradise Loop and Naches Peak Loop Trail. Visiting Wallace Falls State Park and Box Canyon Loop will get you outdoors. 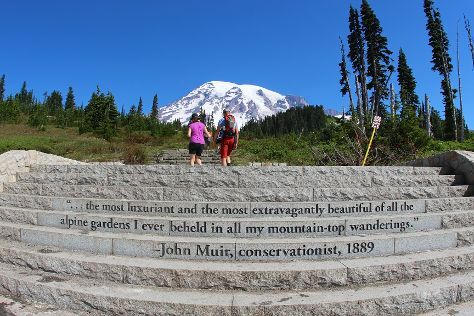 Venture out of the city with trips to Sun Top Lookout (in Enumclaw) and Lake Wilderness Arboretum (in Maple Valley). There's much more to do: explore the landscape on two wheels at Duthie Hill Park, look for gifts at Boehms Candies, make a trip to artEAST, and look for all kinds of wild species at Friends of Issaquah Salmon Hatchery. To find where to stay, photos, ratings, and other tourist information, you can read our Issaquah trip planner . Seattle to Issaquah is an approximately half hour car ride. In May, daily temperatures in Issaquah can reach 68°F, while at night they dip to 51°F. Finish your sightseeing early on the 14th (Tue) so you can travel to Moab. Get outdoors at Double Arch and Upheaval Dome. Explore hidden gems such as White Rim Trail and Gemini Bridges. Change things up with these side-trips from Moab: Arches National Park (Sand Dune Arch & Broken Arch), Newspaper Rock Recreation Site (in Monticello) and Canyonlands National Park (The Needles, Shafer Trail, & more). And it doesn't end there: cruise along Colorado Riverway Recreation Area, explore the landscape on two wheels at Slickrock Bike Trail, play a few rounds at Moab Golf Course, and look and learn at RedRock Astronomy. To find other places to visit, more things to do, traveler tips, and tourist information, refer to the Moab day trip app . The Route module can help you plan travel from Issaquah to Moab. Traveling from Issaquah to Moab, you'll lose 1 hour due to the time zone difference. Traveling from Issaquah in May, you will find days in Moab are a bit warmer (76°F), and nights are about the same (49°F). Cap off your sightseeing on the 21st (Tue) early enough to travel back home.